The red flag of the working class flies over the faculties and factories. Millions of workers are occupying their enterprises. The hard-working masses, whom people called “apathetic”, have started to move. On 13 May 1968, they became aware of their enormous strength, at the same time as they were judging the real weakness of the authorities. During the ten years of Gaullist rule they have experienced the total ineffectiveness of their traditional battle tactics, inherited from the Fourth Republic: parliamentary battles, token strikes, “the days of National Action”, were broken by the strength of the police state, without achieving results. Only the direct, resolute action of the masses can force the Gaullist state to give way. This is the lesson that millions of workers have learned from the victorious student struggle. They have spontaneously and massively applied this lesson in order to solve their own problems. Today the centre of gravity of the fight has moved from the faculties to the factories. The challenge to the bourgeois university has changed into the challenge to capitalist society. For let us not be fooled: if the workers are occupying the enterprises in their millions, it is not simply to obtain a satisfactory answer to their wage demands. The question of Power is being posed in the enterprises and in society. The future of the regime is at stake. The employers and the state are dumbfounded. The panic-stricken Bourgeoise is calling upon the “organisations which are representative of the working class” to take things in hand. It realises that during periods of marked social crisis the reformist leaders of the working class are the best and the last rampart of the capitalist regime: steeped in parliamentarianism, scrupulously respectful of bourgeois legality, these leaders will channel the combativeness of the masses and will direct it towards aims which are in harmony with the survival of the system. To preserve its authority, the cling class is ready to allow temporary concessions. It knows how to wait for the ebbing of the movement, to take back with one hand what it has had to concede with the other. The young workers and the students, who are in the thick of the battle, do not want their fight to end in the same way as the 1936 and 1945 movements ended. The movement of unprecedented size which has sprung up in France today must not produce a damp squib. WE MUST CONTINUE TO THE END! 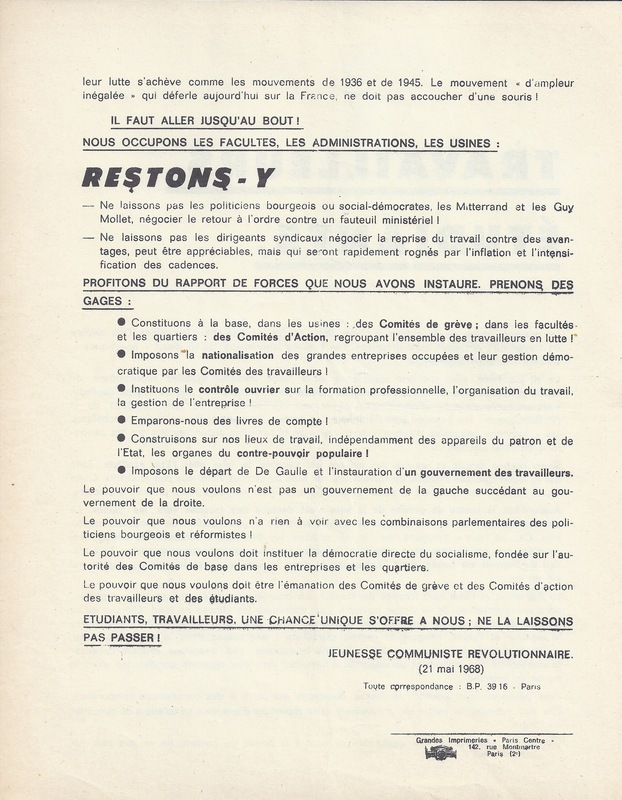 – Do not allow the bourgeois or social-democratic “politicians”, the Mitterands, the Guy Mollets, to negotiate a return to order in exchange for a cabinet seat! – Do not permit the trade-union leaders to negotiate a return to work in exchange for certain advantages, these may be appreciable ones, but they will be rapidly pruned by inflation and by intensification of work rates. Let us consolidate our positions: set up Strike Committees at base-level in the factories, Action Committees in the faculties and neighbourhoods, gathering together all the workers involved in the fight! Impose the nationalisation of large occupied enterprises and the democratic management of them by workers committees! Set up workers’ control over job training, over the organisation of labour, over the management of enterprises! Enforce the departure of De Gaulle and the setting-up of a workers’ government! The power we want is not that of a left-wing government taking over from a right-wing government. The power we want has nothing to do with parliamentary combinations of bourgeois and reformist politicians! The power we want should create the direct democracy of socialism, based on the authority of local committees in the enterprises and in the neighbourhoods. The power we want should emanate from strike committees and from workers’ and students’ acton committees. 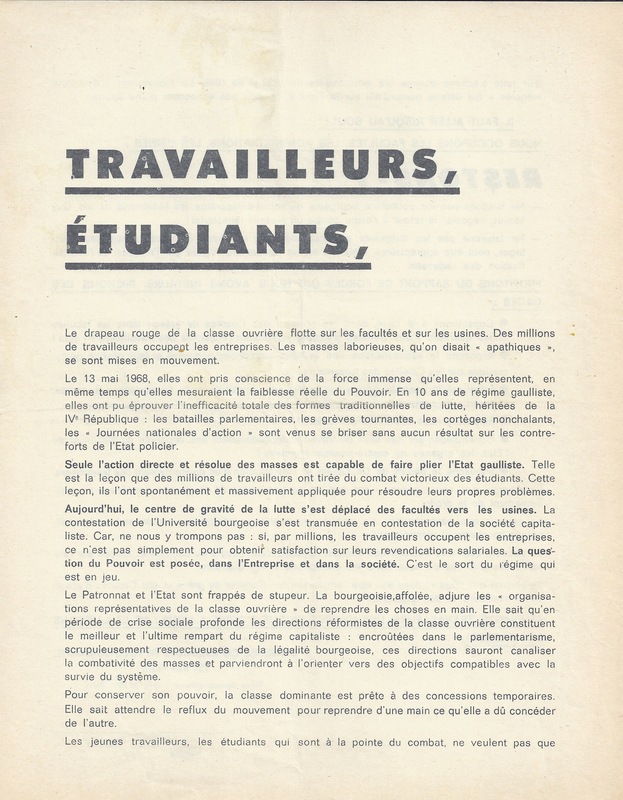 STUDENTS, WORKERS, WE ARE BEING OFFERED A UNIQUE OPPORTUNITY: LET US NOT THROW IT AWAY! THE LEADERS OF THE J.C.R. 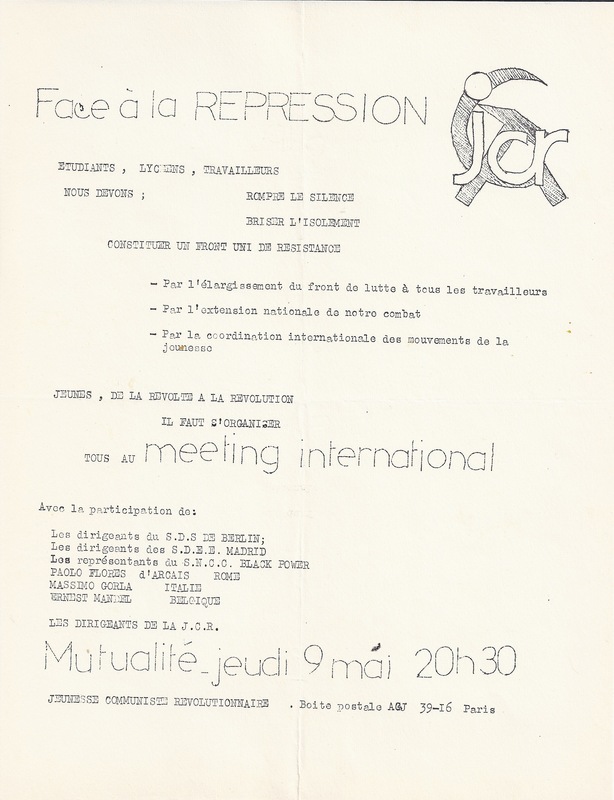 At the Mutualité – Thursday 9 May, 8.30p.m.